Bookkeeper? Accountant? CPA? What is the Difference? The terms "bookkeeper," "accountant," and "CPA" are often used interchangeably. But they are not the same. These three professionals are very different in their scope of work, the tasks they perform, and their licensing and professional status and their standing with the Internal Revenue Service. A bookkeeper is someone who works for a company (either as an employee or a contractor) to keep the financial books. Most bookkeepers these days use accounting software like QuickBooks for this task. 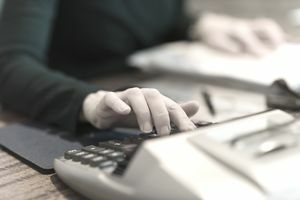 A bookkeeper is responsible for accurately recording transactions, including accounts receivable, accounts payable, inventory, and (sometimes) payroll and providing reports on a monthly, quarterly, and annual basis. I have a bookkeeper for my consulting/writing business. He makes payments for me, keeps track of what I owe on credit cards and other payables, and he gives me monthly reports. He also pays my sales taxes and does my 1099s and 1096 form at the end of the year. But he doesn't analyze the reports or give me tax advice. Accountants are a level up from bookkeepers. They can (but usually don't) perform bookkeeping functions, but usually, they prepare detailed financial statements, perform audits of the books of public companies, and they may prepare reports for tax purposes. But an accountant is classified by the IRS as an "unenrolled preparer," which means he or she has no standing with the IRS in the matter of signing tax returns or representing clients during tax audits and other matters before the IRS. Only CPAs, tax attorneys, and Enrolled Agents are able to represent a taxpayer before the IRS. A CPA has an additional level of credibility and expertise. A CPA is an accountant who has passed certain examinations and met all other statutory and licensing requirements of a state to be certified by that state. In addition to preparing and reviewing financial statements, CPAs also prepare tax returns for businesses and individuals, sign tax returns, and represent taxpayers before the IRS for audits and other matters. The American Institute of Certified Public Accountants (AICPA) is the national professional association for CPAs. Which Accounting Professional Do You Need? Every company, even one as small as mine, needs someone to keep track of the books. Whether you hire an employee or a contractor, you will need a bookkeeper. That bookkeeper might work for an accountant or a CPA. You also must have someone to help you review your financial reports and help you make decisions on finances and taxes. I can't tell you that you must get a CPA, but as I mentioned above, an accountant who is not a licensed practicing CPA cannot represent you before the IRS. To me, this is an important distinction, which is why I have a CPA who helps me review my books and who gives me tax advice, as well as preparing and submitting my business and personal tax returns online.